New technology is sweeping across the African continent at a speed and in an array never seen before. The consequences appear to be a more vibrant, innovative, and democratic continent. Entrepreneurs are using technologies to sell their goods, students are able to access a wealth of online content, and constituents are able to engage their government in more transparent and accessible methods. There is a new excitement surrounding the continent that echoes the feelings that reverberated across Sub-Saharan Africa when the de-colonization process began in the late 1950s. The ability for the continent, often perceived as a ‘backwards’ place, to leapfrog development stages and catch up to the rest of the world excites not only academics, but also development specialists, multinational businesses, and of course the citizens of the 48 Sub-Saharan African countries. While there have been many false starts in Africa’s accession, a recent growth trend that was encapsulated by the heralding of seven African representatives in The Economist’s top 10 fastest growing economies, points toward a future of sustained improvement on the continent. The positivity on Africa’s economic growth spills over into the field of communication technologies and their potential effects on society. This connection between technologies that store and facilitate the transportation of information and communication through time and space, which cause economic, political, and human development impacts is of interest to a broad swath of scholars and experts. The relative speed of change that technology is able to achieve means that those interested in field must be constantly taking in the latest data made available in order to make analysis of what is actually happening. The challenge that is facing scholars is the ability to conduct this analysis while the data is still current. Governments, non-governmental organizations, and multinational organizations and companies are all striving to achieve a level of ‘live-analysis’ that will allow them to react and plan in the best possible manner. However, with the speed of change accelerating due to the exponential growth of innovation, that holy grail of instant understanding by information and communication technology specialists will likely continue to be out of reach. What can be done instead? With predictions and analysis of the impacts of technology always in danger of being outdated by the latest innovation, how can scholars achieve a level of analysis in the field of technology that other disciplines can achieve? Specifically, how can contributions be made to the study still be relevant in an arena where the context of that analysis may be irrelevant by the time it is published? Fortunately, innovation in the field of communicative technology is not a 21st century invention; newer, cheaper, and quicker methods of communicating have been under development since the beginning of time. While there are not always direct historical antecedents of all new forms of communication (the internet and social media stand out), there are ways to interpret these new mediums that can help our analysis. The aim of this paper is to understand the effects that information and communication technologies (ICT) have had on the democratic standing of Sub-Saharan African countries. The study of democracy dates to the time of Aristotle, but the recent focus on how to foster democracy is a 20th century fascination. With the added stimulus of the recent technological age, there is hope that technology can aid and support the spread and consolidation of democracy on the continent. The perspective taken in the examination below is from a skeptical perspective of the inherent democratic effects of ICT. There appears to be at times a simplification of the benefits, and an underestimation of the potential negative effects and uses that technology can be corrupted to produce. In the study that follows, I attempt to lay out the current scene of democracy technology in an effort to put a historical context into the debate as well as a brief quantitative analysis to show whether the data supports the idea that increased democracy technology in fact leads to more freedom. From examining the data a hypothesis will be put forth to explain why the data appears to be out of sync with some of the literature. This hypothesis is then tested by examining countries that appear to be unique in their standing on the continent in regards to ICT and democratic indicators. This paper is an addition to the current literature in the emerging field of “liberation technology”, but it is attempting to frame the issues of democracy and technology in the African context. Much has been written about the potential uses of technology for democracy, both for the empowerment of the citizens, as well as use by authoritarian regimes. However, much of this literature does not consider Sub-Saharan Africa. The likely reason behind this neglect is that the region has yet to see the sweeping change facilitated by youth, injustice, and technology that the Middle East has just undergone. Additionally, the digital methods of authoritarian regimes are not as well understood or studied as they are in places like Iran or China. This paper will attempt to ascertain if any link exists between the current explosion in ICT mediums and the measures of democracy on the continent. It will also seek to inspire new research into the uses of digital control by African governments as a way to protect the growth of democracy on the continent. The relationship between technology and democracy is important to all disciplines in the region. The recent democratic movements in North Africa have highlighted the impacts of ICTs and the examples of repressive measures taken by authoritarian regimes around the world who have utilized digital ICTs for repression show that the consequences impact all of society. Situating Africa as a potential area of future research in democracy technology will help scholars more fully understand the changes that occur in society when the digital ICT wave fully engulfs the continent. To do so, the literature of technology and democracy will be used to frame both sides of the debate on who benefits more – the people or the government. Next, to show that proclamations of proponents of digital ICTs and their inherent democratic effects have yet to be seen in Africa, a simple regression will be used to show how the relationship between digital ICTs and democracy on the continent is murky at best. The literature from the relevant disciples, and examinations of individual African countries will be used to show the lack of democratic effects of digital ICTs in Sub-Saharan Africa. These investigations will be posited along with future areas for research in this field. The contribution of both democracy and technology disciplines (of which a new combined field is emerging) is of critical importance to social science in the 21st century, and much of the data and examples are being drawn from authoritarian societies around the globe. However, much of the discussion only mentions Africa in passing. Despite a preponderance of dictators and technology diffusion, Africa is on the sideline of this important discussion. The placing of Africa in this field will be critical to understanding how technology is impacting democracy in other developing and emerging countries. The understanding that comes from analyzing Africa’s technological revolution in the context of democracy is crucial as Africa emerges as an important actor on the world stage. Since the beginning of recorded time, humanity has been fascinated by how it has organized itself. Aristotle started to categorize how governments held power nearly 2,400 years ago. In the time since, other political scientists have put forth ideas about how the democratic form of popular governance has been created and consolidated. Many of these ideas about democracy have been based on research that examined how governments and constituents communicate between each other. With liberal democratic governments relying on political representatives to create policy and rules for the society at large, the ability for politicians to properly represent the interests of their constituents has largely been based on the ability for the two entities to effectively communicate. Open communication is also seen as a boon for democracy in much the same way it is seen as an anathema to authoritarian governments, thus the reason for censorship. Activists and scholars often point to the need to introduce or foster greater openings for communication as an avenue for democratic reform. With this need for communication, many democracy activists and scholars have championed the newest form of communication technology as a solution to toppling authoritarian governments and consolidating existing democracies. Since the invention of the telegraph all the way through to the Internet, new forms of technology that allowed constituents to communicate with each other in greater number or with greater speed has caused great excitement among scholars who believed that these innovations would have significant impacts on society. However, whether it is placing a radio in each citizen’s home or making mobile phones cheaply available, there have been very few democratic revolutions that are correlated with new technological innovations. If this was true, Samuel Huntington’s three waves of democracy would nicely correlate to the inventions of the telegraph, telephone, television, radio, or Internet. This is not the case. Innovations in communications and information technologies have not inspired the worldwide spread of democracy. This is not to say that the needs of democracy are not fulfilled in some ways by communication technologies. Scholars have discussed how communication and democracy are intertwined in many different ways for decades. In fact, the connection between information and participation in government goes to one of the tenets of democracy: freedom of expression. Robert Dahl writes that to possess “enlightened understanding”, opportunities for citizens to express their own views and engage in deliberation while learning from one another, is based upon freedom of expression. Without this, the ability for publics to engage and influence the agenda and decisions taken by the government would be impossible – exactly what an authoritarian ruler would desire, but this would have terrible outcomes for democracy. Dahl also address the ‘I’ in ICT by explaining how the availability of alternative sources of information also contributes to “enlightened understanding”. If citizens are unable to obtain information from a source other than the government they are unable to effectively participate and influence the public agenda. Thus with the two tenets of democracy that ICT interacts with, freedom of expression based on open communication and alternate sources of information, identify how we can examine the interaction of ICT and democratic ideals. The first tenet would be supported by forms of communication that allow citizens to hear and disseminate views about the public agenda or the government. Citizens could watch a news story on television, subscribe to a podcast, use a mobile phone to call into a talk radio show, or debate an issue in an Internet forum. ICTs add a new dimension to the public sphere, where debate and criticisms in a democracy take place, which have traditionally been coffee houses, parliaments, and large spaces for discussion, including print media. Habermas details this space as existing in the gap between people and the state where debates about common interest in society are conducted. The ability to build virtual networks over platforms like wikis and blogs allow the public sphere to be expanded, and have caused some scholars, notably Castells, to theorize that the ability to move these interactions to a global scale will provide a massive boost for global civil society and the democratic norms that it desires to implement. It also supplements the local and national public debate, adding more voices and more experiences to the discussion. These early forms of social media, where citizens could interact with others, form the basis of what Dahl says is important for a functioning democracy. However, authoritarian governments would seek to allow only propagandist material on that television broadcast, block the ability to downloading ‘unauthorized’ content, plant government supporters to take up all the air time on the talk radio show, and monitor or delete forums on the Internet. Second, alternate sources of information would allow citizens to gain a more informed view of the public agenda in democracy. By using the radio to stay informed of events in politics, use a blog to post their personal experience with a law or policy, or access an open source of contributed information in an online wiki citizens could access information from a diverse range of sources. These ICTs all pose a threat to authoritarian governments because they would allow like minded individuals to compile and spread information that would be critical of the regime and would allow less connected individuals to quickly learn of the current events if they were to access one of these sources of information. To the untrained observer, it would appear that the introduction of any or all of these mediums would allow for citizens to engage their governments in new ways. In a democracy, citizen engaged reinforces the society, in authoritarian regimes, citizen engagement often creates a conflict with the state supposedly relieving the citizens of the repressive regime. However, as the history of these mediums will show, their inherent utopian values are not always borne out during their application in society. The history of technologies that scholars and proponents believed would lead to a spreading or consolidating of democracy and freedom dates back to the 15th century with Gutenberg’s printing press. Hansen calls this the first mass medium, and one that is credited with more social and political impact than any other invention. It’s innovation centered on the printing press’s ability to quickly and cheaply reproduce information. Before this time, books had to be hand copied, slowing how quickly books could be produced and thus preventing the manufacture of significant quantities. This caused the price of books to be high and as a consequence, only those who had significant wealth were able to make their purchase. The result of the new medium immediately challenged the Catholic Church, which had previously held the monopoly on European book production. Hansen writes that the printing press weakened this monopoly in two important ways. First, it allowed dissenting views to be disseminated. Second, it caused a profusion of local language texts to be produced because of the desire of booksellers to reach a wider market. Both of these challenges would allow for an explosion of free expression and the production of alternate information that led to significant social and political upheaval. Ironically, this challenge to the Catholic Church eventually allowed for the consolidation of the modern state across Europe, which saw the centralization of power in the state. This technology allowed larger areas to be administered because of the standardized documents and laws could be disseminated to a larger population that could understand this texts. This enhanced administrative ability allowed states to make and enforce laws within a large defined territory where political power was consolidated and centralized. The rise of a new medium that initially challenged the current power structures, but was later used to consolidate power in new forms and areas will be a theme that follows this review of communication technology . The telegraph would follow this same trend. The medium allowed messages to travel faster over longer distances than the quickest form of transportation would allow. It could only be limited by the length of the wire that communicated the message. The political ramifications were significant, but noticeably in Africa and the rest of the British and French overseas empires. The technology “provided a tool for more effective colonial administration and control” and “enhanced the power of the rulers over the ruled”. The power that Britain was able to consolidate because of their wide ownership of worldwide telegraph cables caused envy and concern on the part of the other powers and ran counter to the belief that a global telegraph network would be “a pacific influence on international relations”. The belief in the media that prejudices and hostilities would fade because of the mass exchange of thought between the nations of the world was unrealized at the time. Instead, it allowed the owner of the new medium to strengthen their position in regard to their colonial subjects and their European allies. This belief of a techno-utopia heralded remained out of reach even with the evolution of telephony. The medium of the telegraph remained the primary mode of communication for the majority of the 20th Century as it took the telephone nearly 100 years to be the primary method of international communications. This echoes the liberal strain of international relations that believes the source of conflict is in miscommunication and misunderstanding and that the increasing contact through technologies improves prospects for peace and cooperation. Hansen identifies two ways that short way radio came into play for foreign and domestic audiences. First, it was able to influence the public in ways that other mediums could not due to radio’s ability to send news reports to a large group of people at one time. Second, the medium became a way for governments to influence public opinion in their countries and those abroad. The ability of voice messages to convey ideas was more effective than that of the dots and dashes of the telegraph. Hansen notes that radio’s effects in the European colonies were specifically pronounced. It allowed home office administrators to keep their in touch with colonial offices and provided a way to communicate the culture of the colonial power to the elite of the colony. While initially focusing on positive themes, the advent of national competition that eventually boiled over into World War II caused the radio to be taken over by messages that were often focused on spreading ‘warnings’ about other countries, which would now be described as propaganda. Eventually the radio became the way that superpowers espoused their ideologies and attempted to raise revolts against colonial or communist regimes. Here we start to see the emergence of sovereign powers attempting to use communication technologies to carry out their national and international objectives, whether that was keeping a local populace under control or attempting to rile up a foreign populace of an adversary. Yet again, the medium is co-opted for less than utopian means. The final mass broadcasting medium in this historical review is television. While it did not end up having the revolutionary effects on society as the radio (the same messages could be communicated by governments to publics), it did effect the power the state. Government officials could communicate in an acceptable type of substitution for face-to-face conversation with the viewer where they could explain their policies and their politics. They could also use images to cause a whole wide range of emotions. The celebrating of national identities through the viewing of a ‘live’ event greatly benefitted those who determined the content of the broadcast. Still television opened up a wide range of information to the viewers through the use of sound and image. However, it further concentrated power in the state because of the lack of interactivity the inherent in broadcasting. There was no way for citizens to submit their feedback through the television set, or for governments to solicit participation. Of course the controlling colonial powers and their replacements also sought to use the medium for their objectives. ‘Development’ television was an initiative in Africa, which began after the departure of the European powers as a way to encourage national development. As will be discussed later, the narratives used by new regimes in liberated African countries often centered on themes of national unity. Additionally, it was believed that television could be used to improve literacy, agriculture, and health through broadcast messages on these topics. The idea of using new communication technologies for socio-economic development has been continued with digital ICTs. Similar to how radio and television were able to penetrate new markets because of it overcame illiteracy, digital ICTs seek to overcome barriers in other ways that prevent the spread of information. In the case of this paper, those barriers are set by authoritarian regimes. But a crucial question remains, what is the reasoning behind a regime’s desire to censor or limit communication and the spread of information? To understand this desire, we must explore more deeply how information and democracy are linked. The link between information and democracy is often found in the benefit of an informed citizenry. Anderson et al. have written that ICT will increase “participation in discussion, decision-making, and task processes by those who are typically politically or economically disadvantaged”. Grossman argues that a potential new form of government, an e-republic, is the next in the logical progression of Montesquieu, Locke, and Madison. This form of government will bring back some of the characteristics of direct Athenian democracy. Previously, representative government was necessary in the world of slow communication and large nation-states. No country could have all of their citizens assemble on their own Pnyx at one time. Citizens had no choice but to delegate the decision making process to representatives to conduct the public’s business. Grossman sees that era evolving because of the increasing speed of information transfer facilitated by the technology of the telegraph, underseas cables, the telephone, radio, television, computerization, and digital technology. Now with telecommunications technology amplifying the voice of the ordinary citizen, the public is being brought right into the middle of the “processes of government”. This would obviously clash with the desires of a state that wished to reduce their populace’s participation in the government. Authoritarian regimes would fear this dissemination of information because it would challenge their monopoly on power and information, as well as allowing the transgressions of the state against its people to spread to the public at large. In a democracy, these new technologies are supposed to bring a better alignment of the public’s desires in domestic and foreign policy. With the assumption that most people desire a prosperous life, and the conditions of such usually require commerce and peace, the public should be able to make their preferences known that they desire this continuation, and thus constrain the actions of rulers in creating conflicts between states. The way a populace can make these preferences known is quickly changing by the empowerment granted by the spread of ICTs. Exploring the impacts of technology on the public sphere, Jürgen Habermas began writing on the effects that communication technology has on the political and social scenes as early as 1981. He writes that the public sphere has always been the source of public political discussion and debate, and defined it as the space between the people and the state. One of the critical conceptions of this space is the allowance for a common area where all citizens of society could engage one another. While this space was previously found in coffee shops, parliaments, and town squares, it now takes place in a global networked public sphere. In this space, social scientists such as Manuel Castells have shown how communications through these networks expand the debate and deliberation between citizens and governments from a national level onto a global sphere. Habermas worries that this public sphere, situated between the private sphere and that of public authority, is increasingly being occupied by connections that are dominated through power and money (entrenched political parties and interest groups). Thus, the revival of the public sphere will rely on the collective action taken by citizen activists. With Castells (2001) arguing that the Internet is suited to diffusing social ideas better than any other medium in history, and Bruce Bimber (2003) adding that the Internet has lowered the obstacles to participation in this arena, it can be seen that ICTs have the potential to empower individuals to participate and collectively act together on a national and global scale like never before. This empowerment will allow them to defend the space as an open area for expression of opinions. This idea of the public sphere and how ICTs empower people to take part in the political discussion dovetails well with Dahl’s framework for telecommunications technology. If the public sphere is to be a place as Habermas describes, an area where citizens can freely debate their societal concerns, there needs to be freedom of expression, an ideal that Dahl argues is supported by communication technology. Secondly, if the public sphere is to be defended against interests that seek to control the debate and discussion through power and money, alternative sources of information will be needed in order to avoid a monopolization of news by the more powerful interest groups. Citizens will be empowered to take part in the public sphere through the digital technologies that both Dahl and Habermas see as supporting a participatory democracy. The relative anonymity of online individuals contribute to this feeling of empowerment by citizens, enabling them to speak up against actors more powerful because of the perceived impunity that the digital world seems to grant. Finally, the crucial need for information in modern society, both for politics and business, means that any actions taken by a group of individuals, or their opponents, in structuring public digital discourse is extremely important. In the developing world, the structure of public discourse is increasing taking place over mobile phones. The quick spread of mobile telephony even among the poor around the world has drawn the interest of those that seek to empower citizens to become more engaged with their government. According to the UN, in 2008, more people had access to mobile phones than justice or legal services. The use of mobile phones in initiatives that seek to empower women, tackle poverty, monitor elections, provide agricultural information, and spur commerce are widespread around the world but particularly in Africa. The ability for mobile phone users to contact their representatives, development organizations, or coordinate with grassroots movements is unmatched by any other device in human history. This medium of interconnectivity is increasing becoming the space between people and government. It may not be long until the global public sphere is conducted entirely over mobile phones due to their high rates of penetration among all socio-economic groups in the world. The provision of information through mobile devices supports the tenets of democracy referred to by Dahl and Habermas above, however the idea that an informed citizen is critical to a functioning democracy has not always been the case. Indeed, some people still debate the role of the informed citizen has in democracy. However, the trend of technological innovation suggests that a more interconnected world will be the future. How this effects democracy, a form of government where careful deliberation has been a hallmark of its earlier forms, have yet to be fully realized. As noted above, the ability of the government to react to the public’s will is more nimble than ever. If the digital public sphere is defended from the encroachment of interests groups, citizens will be empowered more than ever before to participate in political and societal debates. However, the power that the government gains over its citizens is often overlooked by many scholars in this field of technology and democracy. This is likely due to the fact that most of these studies and writings were conducted in solid and stable liberal democracies with citizen’s bill of rights. How communication technology is used in the developing world, both for the cause of democracy and use by authoritarian rulers is found in the next section. The recent proclamations about the power of technology to reshape relationships between governments and citizens has rarely been applied to the African continent. Instead, the information revolution has been cast in discourses of development: closing the modernization gap between the West and Africa. This may be due to how the rest of the world looks upon Africa: as a “backwards region” that needs aid in order to develop. It may also be the result of the rhetoric from many African leaders on how the country must develop economically before the country can expand democratic rights. This paper wishes to swim against this tide and put forth examinations on how technology is interacting with governance on the continent, rather than on development projects supported by Western aid agencies who view technology as a way to ‘catch up’ to the West. This first section of the literature review has shown the importance of information and communication to democratic regimes. It has also documented that the latest fixation with the digital information revolution by democracy scholars is but in a long history of innovation in communications technology. Each medium has affected society in different ways, but it is obvious that no medium brought about the peace and prosperity that heralded its arrival on the scene. In fact, it often resulted in a shift in power, but never directly to the public. Dahl’s framework for digital ICTs bookends this section with his examination of the impact that information can have on both democracies and authoritarian regimes. The ability for citizens to receive and spread alternate forms of information and narratives is crucial in understanding the power of communication technology. Dahl believes that with citizens better informed of their options they will be able to communicate their preferences to the government much faster than before due to new telecommunication technology. However, what happens when the government is not interested in responding or listening to the public’s desires? Habermas suggests that digital ICTs can be used by citizens to defend the public sphere and the tools of new social movements. What if the This next section focuses on the new uses of technology to promote democracy in environments that seek to limited freedom. The multi-national organizations and corporations, along with civil society and nation states, that are concerned with pushing democracy agendas forward have utilized various techniques over the past century to accomplish their goals. However, recent innovations in digital information and communication technologies have caused academics and practitioners to wonder if these types of technologies can assist in pushing these agendas and strengthening democracy. The reason these technologies are heralded are their abilities to transmit and provide access to vast amounts of information. Just recently, academic research has examined the potential for new digital technologies to be utilized for the democracy agenda. The links between access to information and democracy have interested many scholars who provide the explanation on why digital ICTs could play such an important role in democracy. Scholars interested in ICTs and democracy are divided on its actual impact and this line of discourse is divided between the populist view point and those who believe technology will empower the elite. For the purposes of this paper, the former will be referred to as the ‘Open’ literature, while the former will be called the ‘Control’ literature. The former believes that despite the ability to be used for both ‘good’ and ‘evil’ that the inherent open structure of the digital ICTs will win out in the end. The other side worries that the ability for governments to pressure private corporations to add restrictions to the Internet and to use surveillance technology is actually decreasing citizens freedom, both in the digital world and in their day to day activities. To better understand these view points and their supporting arguments, the next section is divided between the two schools of thought, and presents the qualitative and then quantitative works of each discourse. Before that dichotomy is established, an overview of the field will elucidate the discussion. The growing literature about the uses of digital ICTs for the democracy agenda has coalesced around the term liberation technology, a term coined by Stanford professor and democracy scholar Larry Diamond. Diamond calls liberation technology part of the remarkable abilities of the Internet that can expand political, social and economic freedom. The term has caused debate around the implied abilities of the technology that Diamond references as liberation tech, namely digital ICTs. Countering, other scholars have pointed out the possibilities this technology has for authoritarian regimes to exert more control over their citizens through the accessing of personal information or the filtering of outside news and websites. Diamond assures us that he does not mean to imply that this technology is inherently ‘good’, in fact he writes that “it is not technology, but people, organizations, and governments that will determines who prevails”. However, much of the present day news media and to an extent those development organizations that work in the ICT4D (for development) field, often promote the liberating abilities of technology. Diamond’s views step back from the debate between ‘control’ and ‘open’ and presents both fields more objectively than some other authors. He also presents succinctly what liberation technology encompasses, thus allowing further discussions to correctly identify the types of technologies that could be classified as such because of their supposed democratic-abilities. According to Diamond, liberation technology “enables citizens to report news, expose wrongdoing, express opinions, mobilize protest, monitor elections, scrutinize government, deepen participation, and expand the horizons of freedom”. This definition can be applied to many different types of technologies, which is Diamond’s point. He is careful to point out that technology is neutral and thus the same types of technology can be used by authoritarian states to filter and control these interactions, as well as identifying and punishing political dissenters. Diamond recognizes that there is a current battle underway between autocrats and democrats to control these technologies in order to aid their agendas. Who wins the race will not just be based on who has the better grasp of technology but who can organize and strategize on a societal level. Diamond’s first definition of liberation technology centers on the societal impact of technology, he clarifies it to narrow the types of technology he sees having this type of impact, specifically modern digital information and communication technologies: the computer, the Internet, mobile phones, and the apps that connect people to “new social media” such as Facebook or Twitter. The game changing benefit of these modern ICTs over previous innovations is the decentralized nature of the medium. Both the Internet and mobile phones are well suited for use by grass roots activists because of the ability to spread information quickly and the multiway forms of communication that are in stark contrast to the one way transmission of radio and television. Thus users of these services don’t just receive information, but they can generate and disseminate information themselves. In this way it empowers those who are marginalized by traditional forms of political or economic structures, allowing more sectors of society to engage and mobilize. In Africa, Diamond points out that the power of mobile phone networks have potential to be “accountability technology”. Those are tools that provide for transparency and monitoring. Whether recording police brutality or monitoring national elections, one of the simplest forms of new digital ICTs, the mobile phone network, can quickly spread information and only need the infrastructure of a few cellphone towers. Elections in Ghana and Nigeria have utilized citizen’s mobile phones to report irregularities or suppression during voting. Diamond reminds us that the rise to prominence of modern digital ICTs is not unprecedented. The innovation of the printing press allowed people to challenge the central state and led to the start of the Renaissance and the Protestant Reformation, but the production of books was quickly censored and put under state control soon after Martin Luther used it to challenge the Catholic Church. This trend of co-opting new technology by government continued with the invention of the telegraph, the radio, and the television as seen previously. Instead of the technological utopia that quick transmission and more diverse spreading of information was supposed to bring, history has seen regimes co-opt these technologies to consolidate their power and suppress their populations. This is perhaps Diamond’s key reminder to those who believe the spread of technology automatically brings democracy. Technology is just a neutral tool that can be used by both those who seek to allow reasonable debate and by totalitarian regimes that commandeer it for their own purposes of survival. This first section reviews the literature by authors that believes digital ICTs, specifically in many cases the Internet, has a noticeable and positive effect on democracy. Essentially, they believe that the power of ICTs create openness through the access and spread of information. Their enthusiasm for the Internet and its ICT relatives is the “idea that elites and political intermediaries will grow less important”. With that reduction in the power of the elites, the ordinary citizen can flex his/her political and civil rights more fully. Proponents of the democratic power of ICTs and their liberating abilities often point to the positive feedback from users in the field. This first hand accounting is usually held up as evidence that the tools provided by ICTs support democratic movements, with the recent Arab Spring as an embodiment of liberation technology’s potential in action. Many demonstrators spoke of their ability to coordinate with each other in their political action. In fact, the power of ICTs in the region were being exercised in the years leading up to the Arab Spring, a topic that Patrick Meier has written extensively about, notably about a piece of technology he helped develop: Ushahidi. The platform name, Ushahidi, the word for evidence Swahili, is an open source software that allows users to plot important events on a crowd-sourced map. This means that citizens can contribute information during occurrences of political violence, during elections, as well as natural disasters. Through SMS, Facebook, Twitter, Flickr, Youtube, email, and voicemail users can add events to a map of the occurrences in real-time, allowing the media, government, or emergency services to see events on a map as it happens. This software was born out of the post-election violence in Kenya in 2007 and 2008. With the government censoring or otherwise hindering the Kenyan media’s reporting or investigations into the violence, citizens were able to report acts of unrest or politically motivated violence to Ushahidi, which then displayed a map of all the user-reported information. Ushahidi is what Meier calls a ‘new’ ICT. He defines this by using the term to describe technology as “radically different from traditional communication tools”, meaning the ability for multiple users to interact and communicate without the centralization and control that comes with the mediums of television or radio (96). With Ushahidi, there is an added avenue for understanding live-events. With radio there is a sound and television an image, with Ushahidi there is a geographic location that leads to wiki-like indexing reflex. Instead of users adding text to a wiki page, contributors add to a map on the Ushahidi platform. Meier has outlined the use of Ushahidi in Egypt during the election in 2010. His interviews with activists in the time period afterwards suggested an increase in civic participation because the online nature of the platform allowed ideas to be expressed more easily. It allowed for the observation of fraud and violence in a way that even traditional election monitors could not offer. With the Mubarak regime still technologically illiterate, the organizers of the project that ran the Ushahidi platform were able to operate without sparking the retribution or crackdown of the regime. With the project able to operate with minimal interference (the organizers even gave the the Egyptian National Security an account on the platform, but anything they deleted was easily restored) the platform was able to help frame alternative discourses to the regime’s propaganda during the election. Those interviewed pointed out that the ability of the government to use the internet to foster any patriotic sentiment to help sell their discourse was largely a failure. Thus the goals of the project, to inform a domestic and international audience about the electoral process, to expose fraud, raise awareness of the importance to participate, and flex citizen’s basic rights, all while providing data to advocates of free and fair elections were all largely successful according to Meier. However, the impact as Meier admits, is less easily determined beyond the qualitative data that was collected in interviews. In the end it allowed the project’s organizers to offer an alternative to the state media and generate international interest in the 2010 election as a result. It also signified the regime’s failing in the digital world which foreshadowed the actions that Mubarak and his government took during the Arab Spring in 2011. Another scholar who focuses on the Arab world and ICTs, Howard traces the timeline of how digital media was utilized by activists in the Arab Spring because as he writes, “the precise mixture of causes may have varied from country to country, but the one consistent component has been digital media”. The first phase of digital media usage for democratic movements involved activists finding creative ways to use technology to identify like-minded individuals, building solidarity around grievances, and establishing political goals. This preparation phase was followed by the ignition phase, or an incident that was ignored by the state-run media that was circulated heavily among the online community. This caused the third phase, street protests, which were facilitated by the online connections and coordination of the activists. The prolonged street demonstrations led to international buy-in, made possible by the swath of information about events on the ground being published on digital media. The climax saw regimes bring about enough repression to eliminate the protestors, begin to crumble in the face of their demands, or end in a bloody stalemate or civil war. Howard identifies a key final phase, that of follow-on information warfare among the remaining actors as a battle to shape the discourses of the revolutionary narrative in order to influence future events. Howard also points out the macro socio-political actions taken by activists were strongly aided by digital media. The first was the process of ‘building down’ the authoritarian regime’s credibility by disseminating information about their corrupt practices. This was done primarily on the Internet because there was no other medium or forum to share this information. It also allowed both men and women to debate policy alternatives and expose regime secrets on an equal plane. These ‘digital habits’ as Howard calls them, allowed activists to have a familiar realm of communication and discussion to turn to during political crisis. Howard does write that technology is not causing these revolutions themselves, however he does stress that many of these social movements had existed yet never had any real success until a tipping point was reach in regards to the use and penetration of technology and social media. His central idea in his previous writing on dictatorship and democracy in the Islamic world, was that the government has lost part of its previously unchallenged power in one of its two key areas. Howard writes that government control over the military and the media has been transformed by diffusion and distribution of infrastructures of information that are not government controlled. Instead of televisions and radio supporting the political communications of the elite in Muslims populations, innovations in software and hardware applications allowed citizens of these countries to communicate with diverse populations with different narratives, as opposed to the monopoly of government propaganda. This technological diffusion has allowed political parties to compete, journalists to investigate, and civil society to organize. With the importance of ICTs in democratic movements clear in his research, Howard lays down the goal for scholars of international studies: to understand the casual conditions for contemporary democratic transitions and consolidation. While not identifying Dahl’s conditions for democracy, Howard does lay out how ICTs play their part in allowing for communication between citizens and the spread of information. ICTs reduce the level of uncertainly that comes from the lack of information felt by citizens. Citizens can decide which conversations to join and which political groups best fit their interests. ICTs also involve a wider spectrum than previous mediums because of the cost of entry. Those in the diaspora, impoverished locals, and elites can all use the same medium of communication. This also applies to cross-border communication. Howard writes that the older national-media often prevented the cross-border interactions that can inform citizens on events that are happening outside of their local network. Finally, in terms of alternate information sources, ICTs allow civil society to monitor and report on the actions of governments. Howard argues that civil societies competition with the state in terms of social services (and the ability to promote these services through ICTs) improves the offerings by the state. In addressing the possibility of censorship, Howard writes that paper and ink can be rationed or cut off from being delivered to traditional information sources like newspapers, the power of digital information technologies is their wide diffusion. Even though power can be cut, the government is not able to effectively shut down activists in the diaspora according to Howard. Here, he doesn’t account for the digital strike capabilities that are discussed by Morozov and MacKinnon later in this review, however Howard makes the case that the diaspora can offer a counter narrative that can be spread widely, which would have been extremely difficult in the world of pre-digital ICTs. Finally, putting forth an interesting metaphor with which to understand how social media is interacting with society, Howard calls the medium “the scaffolding upon which civil society can build, and new information technologies can give activists things they did not have before: information networks not easily controllable by the state and coordination tools that are already embedded in trusted networks of family and friends”. Howard’s contention is that the frequency of using ICTs for good, far out distances the use of ICTs for authoritarian regimes, and thus the power dynamic of the state and the citizen has been unmistakably shifted permanently in favor of the constituents. However, Howard does not account for a situation where the state may have more technological capability than its citizens. His analysis in this case presents limitations for applying it to African countries where ICT penetration is much lower than countries in the Middle East. Two of the earliest quantitative studies in the field seemed to point towards a digital democratic future. While they stopped short of saying that the Internet would cause democracy, both showed that countries who saw the largest diffusion of digital ICTs (both measured communication technology) positively correlated with democratic indicators. Totalitarian societies face a dilemma: either they try to stifle these [information and communication] technologies and thereby fall further behind in the new industrial revolution, or else they permit these technologies and see their totalitarian control inevitably eroded. In fact, they do not have a choice, because they will never be able entirely to block the tide of technological advance. This idea of the Dictator’s Dilemma has been expanded upon by other authors recently, likely due to the increasing interest in using ICTs to combat authoritarian governments in Cuba, China, and the Middle East. In contrast, Kedzie’s timeframe is at the end of the Cold War and how ICTs (specifically access to email) played their part in what eventually became the Third Wave of Democratization. Specifically, Kedzie wonders how Gorbachev was to navigate benefitting from the global economy without losing any domestic control. Kedzie points to electronic mail as the medium that escaped government control that allowed information to flow into the Soviet Union and then be transmitted with the country. Despite electronic ICT not playing the primary role in the revolutions in Eastern Europe at this time, Kedzie does place the creation of asynchronous electronic telecommunication networks as part of a fundamental improvement in the ability to communicate. In fact, in Kedzie’s view, it is part of the trend in history that saw technology diffuse power through information away from elites and to individuals. Kedzie sees this trend began with the creation of writing (bringing permanence of information), then the printing press to allow for distribution, followed by the telegraph (conquering distance), the telephone (allowing for interactivity), and finally the television (bringing visual images). These all created dictator’s dilemmas in their own time. 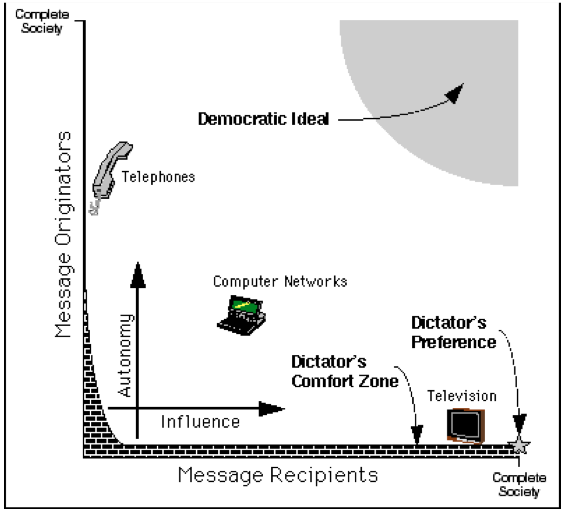 Kedzie shows a image of the number of senders and receivers of information and how the internet and digital social media may better aligned with the democratic ideal (Image 1). However, Kedzie admits, up to this point there had only been anecdotal evidence of the democratizing effect of new communication technologies, similar to 2012 with mobile technology and digital social media. His study set out to address this gap in the scholarship by examining the empirical evidence. 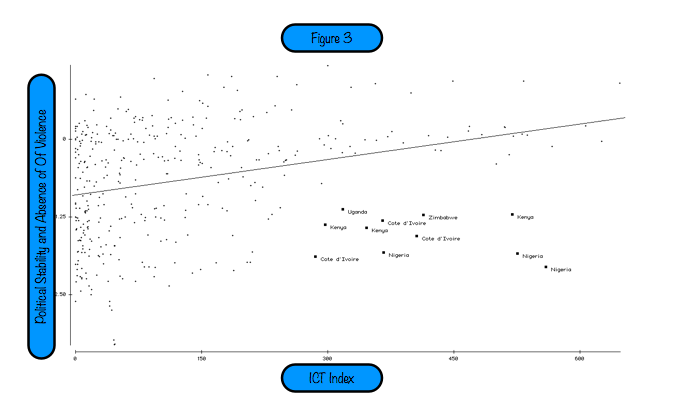 Using linear regression, Kedzie tests the dictator’s dilemma by comparing the traditional indicators of democracy (economic development, education, human development, and wealth) against the strength of Internet prevalence. On the basis of studies across 144 nations, Kedzie finds that the Internet is a stronger predictor than the traditional democratic indicators. His limitations centered on the years of comparison (1983-1993) from which he draws broad conclusions upon his simple longitudinal analysis. However, his is the first to find a positive correlation between Internet diffusion and democracy while controlling for different regions and different indicators. Despite the profound conclusion reached by Kedzie, and the limitations and opportunities his study presented for future researchers to build upon, it was not until 2005 that a study with more recent data was published. While Best and Wade’s questions cover a broader spectrum that Kedzie’s, they did address the central inquiry about the Internet’s democratic effects: what was the global effect of the Internet on democracy between 1992 and 2002. They sought to measure this effect by measuring the levels of Internet prevalence and the measures that monitor democracy. The democracy measures included gross domestic product per capita, adult literacy combined with measures of nation’s civil liberties and political rights. Measuring Internet penetration was done by comparing the number of Internet users per 1,000 people. Their results show that the Internet was unable to explain the variations in global democracy levels between 1992-2002. However, when taking only the 2001-2002 results, their data showed a strong relationship between the two measures. It was not constant across all regions, with Asia and Africa experiencing the most substantial effects. Wade and Best compared across regions by finding the additional number of internet users that would cause an additional one extra point on the Freedom House scale that they had used as their democracy measure. Asia needed only 8 more users, with Africa needing 14. This compared to Eurasia and Latin America where more than 60 internet users would cause a one point increase in Freedom House’ democracy scale. The correlation between internet and democracy maintained even when controlled for region, economics, and social development in the 2001-2002 data set. These findings led Wade and Best to claim that the Internet could explain levels of democracy better than literacy and geography, but stopped short of saying that the Internet “was a natural boon to democracy” primarily because of regional variance. They attribute the recent change in the effect of the Internet to the transparencies of governments and NGO efficacy. Wade and Best believe that the impact of the Internet in the years of 2001-2002, when Internet penetration becomes a better predictor of democracy than GDP per capita is a signal “that the Internet has come of age as a correlate of democracy”. If this were true, then by using more recent data, we should see this trend continue. Important for this study’s analysis, they found there to be little multicollinearity issues between literacy and Internet usage. There were issues between GDP per capita and Internet usage, but in the years 2001-2002, instead of GDP per capita absorbing some of the Internet’s beta weight, the reverse occurred, which supports their hypothesis of the Internet coming of age. Evgeny Morozov examines how governments are devising and implementing new tools to control, exclude, and filter the types of uses and information that their citizens’ technology can employ. The most famous example is the Great Firewall of China. Through the exclusion of particular websites, or search terms, combined with a team of cyber-police who monitor blogs, chat rooms, and forums, China has sought to take their socio-political control into cyberspace by filtering the Internet. However, due to the extreme and well known nature of these controls, many other governments have sought other means to achieve their goals by other means in order to not be lumped in with China and suffer the soft power backlash. More nuanced methods of control include, distributed denial of service (DDoS) attacks, the infiltration of online communities, the ‘nationalization of cyberspace’, the outsourcing of controls to third parties, and utilizing private sector innovations to improve the effectiveness of authoritarian state’s police. DDoS attacks are the directed at websites with artificial Internet traffic generated by the attacker. This causes the website to shut down for an indiscriminate amount of time and denies access to all other users. The benefits of such an attack are the impunity of the attackers because of the difficulty to trace attacks and the ability to deny access to everyone across the globe (something that Internet filtering cannot do). Due to the bluntness of Internet filtering (and the rally around the flag effect that it can create for opponents), more specific tools like DDoS attacks and dispatching new members to online communities can be more effective. While the infiltration of online communities in order to erode their social capital and cohesion can be labor intensive, it can be an effective way to cause division in the community – much how a physical double agent can cause fissures and disharmony in opposition groups. Thirdly, some countries are reacting to the ‘liberation‘ effects of digital ICTs by banning certain services or platforms and replacing them with national-based solutions. Search engines, email, and social media, are the main target of this effort. Google Search’s absence in China has been replaced with Baidu, Google’s email offering, Gmail is banned in Iran, plus Turkey and Russia have been developing their own national based search and email services, with Turkey saying that it will cater to “Turkish sensibilities”. Looking for the cheapest option available to both democratic and authoritarian governments, the state has placed the responsibility to uphold internet and communication regulations on the private sector. This is done forcing the service providers and individual internet companies to police their own environment in order to comply with the country’s regulation. Even democratic countries enforce this kind of standard: Italy holds YouTube accountable for the videos that are posted by users. Going one step further, in developing or emerging countries, governments employ the abilities of their citizens to report offensive content. In Thailand a website has been set up to receive complaints of Twitter messages that are deemed offensive to the regime, while a government committee has been established in Saudi Arabia to allow citizens to submit web links to in order to have them blocked. Morozov allows that while these authoritarian techniques will undoubtedly eventually have counter-measures deployed against them, many authors do not take into account the social and political repression that may mount because of the openness that the Internet provides. Instead of putting up walls and barriers for a blogger to interact with the world, it would by much simpler, and cheap, to psychically jail the blogger. Ironically, Morozov points out, the very freedom that digital ICTs proclaim to bring, may cause more socio-political repression and barriers as a backlash. Mackinnon adds a new term to the literature with ‘networked authoritarianism’ -used to describe the state of affairs when an authoritarian regime embraces and adjusts to the inevitable change brought by digital communications. She uses this term in relation to the Chinese regime, and suggests that contrary to some analysts the increasing access to the internet has bolstered its political legitimacy with its domestic constituents. The ability to squash online discontent, but allow limited debate on and activism about issues that do not challenge the regime’s power has allowed China to co-opt the power of digital ICTs to entrench authoritarianism. By controlling the public square of online debate the Chinese are able to filter any undesirable or sensitive content from being published or discussed. Mackinnon’s focus on internal China, while more specific than Morozov’s international overview, shows that the techniques used for Internet control are deployed to a significant extent in the country. These include cyber-attacks on companies or individuals, hardware controls, controlling the ability to make new websites, and flipping the internet’s ‘on/off’ switch. These tactics are combined with surveillance and public outreach that seeks to steer the direction of online discussions. Two recent quantitative studies that support Morozov and Mackinnon, find that the Internet has little causal relationship to democracy. While not necessarily finding support for the theory that digital ICTs can increase repression and anti-democratic tendencies, both studies conclude that the ‘open’ literature may have over hyped their findings. The major breakthrough they accomplished by integrating mobile phone data into their data sets, was offset out by the disaggregating of their mediums. They separated the Internet and mobile phones, thus not capturing the confluence of phones and the Internet. With the rise in smart phones, mobile phones with Internet access or apps that could access many parts of the Internet and social media, the difference between the Internet and mobile phones is disappearing. Their findings regarding mobile phone use in fact contradicted the ‘open’ literature as they found Voice and Accountability to be negatively correlated with increases in mobile phone penetration. This anomaly, or perhaps supporter of the ‘control’ literature, is difficult to place in current context because of the qualitative findings with the movements of the Arab Spring. The second study by Groshek provides one of the most recent quantitative studies that looks at the Internet and democracy. He took a different route than Wade and Best and Stodden and Meier. He sought to establish a forecasting model of democracy for the years between 1994-2003. He found that the actual levels of democracy in the countries he examined were not higher than predicted, which led Groshek to conclude that the Internet is not a “casual mechanism of national-level democratic growth during the timeframe analyzed”. He believes that instead, the Internet is simply a component of the democratization process, or perhaps as Lipset would say, just another piece of the modernization puzzle that leads to democratization. Interest in the democratic agenda has been on the upswing since the fall of the Berlin wall. With recent protests against autocratic regimes using the medium of digital communication technology there exists a need for understanding how ICTs and democracy interact. With democracy on the African continent seeing regression or stagnation since the reform days of the early 1990s an exploration of the technological advances on the continent will be important for policy makers and civil society to plan their future activities on the African continent. Understanding how democracy might be consolidated or advanced will also be of great use to scholars and policy analysts. Currently in fashion, due to the mediums used in the Arab Spring, technology is heralded as a causer of democratization world wide. However, this contrasts with some of the growing authoritarianism in the Middle East, China, and Africa. Diamond once asked whether the Third Wave of democratization was ending. He answered that it had drawn to a halt and now the challenge was to prevent a reversal. The question now posed is whether ICT will be the foundation on which a fourth wave grows or whether digital communication technologies will be used by rulers to seek to roll back and prevent the consolidation of recent democratic advances. Africa is important in this discussion because of the increasing types of liberation technology that are found on the continent and the continued presence of authoritarian regimes that need to be combated. While the Middle East receives the attention of the world and of academia, Africa is an important factor in the study future of technology for democratic purposes. There are different cultural, geographical, and historical components that separate African and the Middle East, which are too lengthily to list here. This discourse on open or closed networks are critical to those interested in African studies because of the ways that ICTs impact entire societies, often quicker than anticipated. All disciplines will need to heed the incoming impact way caused by ICTs in order to present the current and future state of Sub-Saharan Africa in their research and analysis. By factoring in this rapid technological development, more accurate pictures of African life can be created. The literature review above shows that there is much interest in how communications technology interacts with democracy. This includes how it can benefit democratic institutions and movements, and how digital ICTs can be used by authoritarian regimes to maintain control. Additionally, there have been major quantitative studies done to see how the Internet and mobile phones have affected democracy on a global scale. However, none of this analysis has been focused on the African continent. My data analysis shows some significant results that can add to the literature. The authors above significantly contributed to this paper’s methodology. Howard used both a quantitative method with statistical tools to describe “how variation in democratic outcomes are correlated with variables that serve as proxies for theoretically interesting explanatory factors” and a qualitative approach for specific cases. Stodden and Meier saw the importance of combining both the internet and mobile phone data to create a more comprehensive measure of ICT. Finally, Groshek as well as Wade and Best provide the scholarly motivation to attempt to quantify the effect of digital mediums on democracy over a broad geographic area. This guidance, combined with the staggering amount of growth of mobile and internet connectivity provided the impetus for this study (see Figure 1). The data for ICT was collected through the African Development Bank’s (AfDB) Data Portal. The Worldwide Governance Indicators (WGI) came from the World Bank’s data, which measures six different dimensions of governance: Voice and Accountability, Political Stability and Absence of Violence, Government Effectiveness, Regulatory Quality, Rule of Law, and Control of Corruption. These indicators are the result of a combination of views from enterprise, citizen, and expert survey respondents. The individual state sources come from institutes, think tanks, NGOs, and international organizations. The World Bank’s data was chosen over Freedom House’s Index in order to correlate specific influences of ICT to different aspects of governance as Stodden and Meier did. Additionally, collection of data on education, health, and other possible influencers were unavailable in a full set, thus GDP per capita as measured by the AfDB is the control for ICT. Once the data was collected, a need arose to compare total democracy indicators and total ICT indicators. For democracy, the individual WGI were totaled by country for each year, while for ICT, a simple index was created by weighting Internet users twice as much as mobile phone users. This was done in order to emphasize that the access to the Internet opened more avenues to freedom of expression and the ability to retrieve greater amounts of alternate information than mobile phones. While the growth of smartphones with broadband access has grown, at the time intervals (2000-2010) in this analysis, they did not play a significant role on the continent to interfere with this weighting. This index undoubtedly captures some users twice (those that have a mobile phone and also are Internet users), but this is not necessarily a hinderance. The goal of the ICT index is to capture as best as possible, how connected any given nation is. If a user has access to both mediums, he/she is more connected than a user who just has one available, and thus should causer the index to be higher. Finally, the scope of the study is set on Sub-Saharan Africa. With significant cultural and economic differences between North Africa countries and those south of the Sahara desert, the study based its the geographic boundaries on the United Nation’s geographic groupings. This meant, Algeria, Egypt, Libya, Morocco, South Sudan, Sudan, and Tunisia were excluded from this study. Thus when using the term ‘Africa’ it is in reference to those 48 countries south of the Sahara. While data for all 48 was collected, the WGI had no data for Djibouti in the time frame under examination, and thus that country was left out of the final results. First, in Sub-Saharan Africa there is no relationship between the increases in digital ICT users and improvements on democracy. Second, there are outliers in the data, where countries with high rates of ICT users, have significantly lower scores than other countries with similar rates of ICT users. These findings suggest that the perceived benefits of connectivity had yet to make their potential impact on the continent in this time frame. 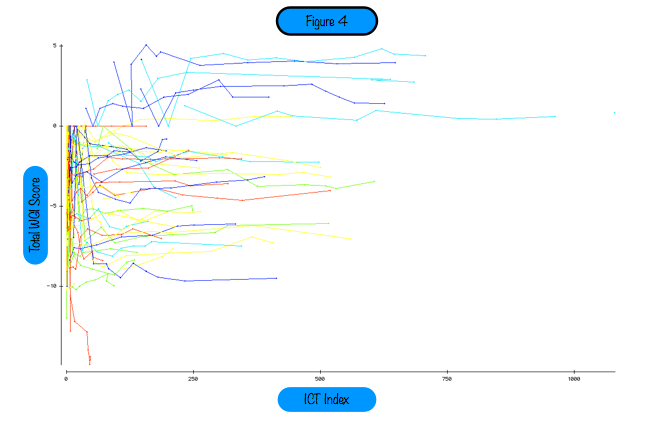 All six WGIs were compared, but none showed any significant relationship with the ICT index. Additionally, both the combined ICT index, as well as the individual communications indicators (internet users and mobile users per 1000) were compared and none appeared correlated to WGI numbers. Thus the explanations below are using the combined communications data. Endogeneity was a concern because of authors like Pippa Norris contradicting Kedzie’s argument that causality ran from technology towards democracy. Endogeneity was controlled for by using a lagged regression to see if ICT might impact the WGI scores after a certain period of time. This was found to be false, and as a simple reading of the data would show that having had little progression in improving governance, even lagging ICT would not show a relationship. 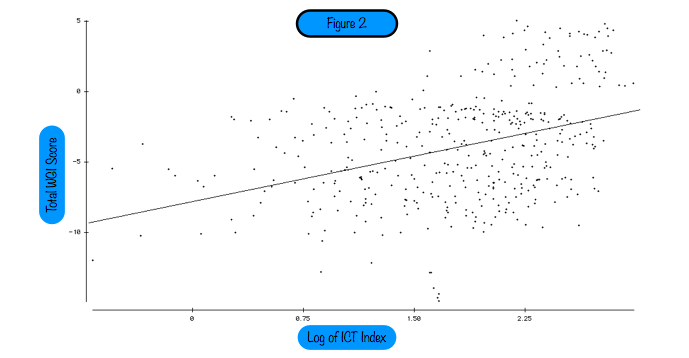 The first finding was reached through the regression of the log of the ICT index with the total WGI (See Figure 2). The ICT index could only explain 14.3% of the World Bank’s indicators, and despite the positive correlation, there is much more going on in the data set than ICT can account for. When explored further, democracy as a whole on the continent appears to be stagnant, with a particular band of countries (Mauritius, Botswana, Cape Verde, Namibia, South Africa, Seychelles) above the rest of the continent for the entire 10 years in the study. This is despite the massive increase in ICT in all of Sub-Saharan Africa, especially in the years from 2007 onwards. Obviously, communications technology is not the panacea for African democracy, but the worrisome finding is that there were few countries that saw their democracy scores increase, and there were some notable negative movement in WGI indicators. These overall findings generally line up with Freedom House and The Heritage Foundation’s freedom scores: continent wide, the past ten years have not seen a growth of freedom or democracy. This finding spills over into the individual WGIs as well. Explaining these results from the raw data along is difficult. There is nothing that stands out that makes these countries significantly different from the others. While China is a significant contributor in foreign direct investment to each of the countries that stand as an outlier, it would be difficult to draw a direct link between the increases in FDI to stagnation or dips in WGI indicators. All of these countries have seen significant growth in connectivity, yet haven’t reaped the supposed democratic effects. The hypothesis put forth is that the current uses or implementations of ICT in these countries have not properly created the two uses of telecommunication put forth by Dahl, nor created a sufficient public sphere that would satisfy Habermas. A qualitative investigation looking at three country’s recent histories and possible inadequacies in their ICT implementation will provide a fuller explanation below. From the analysis in the last section, the absence of a relationship between ICT growth and democracy indicators was unequivocal. However, this runs counter to significant techno-optimism that cites the significant growth in mobile phones, the Internet, and even radios as part of the reasons for potential democratic growth on the continent. In order to provide a deeper understanding of the failures of technology to provide a democratic spark, an overview of certain countries will provide an insight into challenges for using ICTs in democratic projects. Countries that were revealed as outliers in the previous data set provide the best examples to examine. In these countries, their ICT Index score was significant enough to separate them from most other African countries, while their Governance Indicator was much lower than any other country that had the same level of ICT penetration. Kenya, Nigeria, and Zimbabwe were three of those countries, and a grouping that will provide three unique looks at ICTs and democracy on the continent. Each overview will address a separate usage for ICT: in Kenya, a software platform used in elections, in Nigeria, the national ICT policy, and in Zimbabwe, an NGO network seeking to use electronic media as a democratic enhancer. The structure of each overview will investigate the possible socio-political events in the country during the outlier year. Then the ICT for democracy usage will be appraised by a framework adapted from Dahl: how does it affect freedom of expression or open communication, and secondly how does it contribute to alternative forms of information. The indicator that represented an outlier in Kenya’s case was Political Stability and absence of violence in the year 2010. This indicator measures perceptions about the likelihood that the government will become destabilized through forces using violence or unconstitutional means, including domestic violence or terrorism. There are various events that may have contributed to this low score on the World Bank’s indicator. The country voted in favor of a new constitution in the latter half of the year, the International Criminal Court opened an investigation into post-election violence, and the spill-over effects of the crisis in Somalia began to be felt more strongly due to the flow of refugees. While the creation of a new constitution would seem to signal a return to stability, the fact that the ink was just drying as the year came to a close likely contributed to the low indicator. Additionally, violence had been used in attempt to prevent the signing of the new constitution. The second important event, that of continuing judicial impunity, remained a “pervasive problem” in the country according to Human Rights Watch. Those investigating the post-election violence have had difficulty securing the protection of witnesses and this has significantly hampered the country’s progress. Finally, while the unrest caused by the Somalia conflict had not reached its current levels of al-Shabab attacking downtown Nairobi, the abuses committed by the Kenyan police in the north were significantly undermining the countries faith in its domestic security forces. In the face of these events, were there any projects underway in 2010, or have since been launched that would address this Political Stability indicator? In 2009, the Swedish International Development Cooperation (SIDA) identified election monitoring as a primary area of potential use of ICTs for democracy in Kenya. To that end many individuals and organizations have looked toward the elections in 2012 as a date to prepare their projects. Nyanza Partners for Peace Alliance, using the Ushahidi open-source mapping software, seeks to allow the community to share information in order to prevent and manage conflict. The Nyanza province is in southwest Kenya on the shores of Lake Victoria and an area that was effected by violence following the 2007 election. The community members would be able to use the Ushahidi platform to submit many different categories of events in order to inform the other users through the use of SMS from mobile phones, pictures and videos from smart phones, or reports submitted through personal computers. How does this type of project address the indicator in question, and does it relate to any of Dahl’s two main points about communication? In theory the ability to track election events should deter perpetrators who would know that a digital record of their abuses or fraud would be available for the whole world to see. Additionally, it would meet one of Dahl’s purposes as it would provide alternative information to the narrative of the election under monitoring. With citizens submitting data, the government’s narrative, if it differs, would be challenged by a digital record. In practice however, it has been hard to draw from past experiences of the use of Ushahidi that the platform actively discouraged election officials, or other interest groups, from interfering in elections. While Meier documented in Egypt the use of Ushahidi by activists in the 2010 election, this did not prevent the fraud from happening. This is particularly pertinent in Kenya, as Ushahidi was created for the post-election violence in 2007 as noted earlier. However, despite the swath of information that the the platform documented, impunity still holds for most of the perpetrators of the violence, save for a select few top officials. Finally, while platforms such as these can provide alternative sources of information, these organizations would still be reliant on traditional or social media to disseminate any of their results. As we’ve seen in Egypt, Iran, China, and Ethiopia, the government can silence these platforms if it is motivated. While that may be difficult in an environment that is hardly authoritarian in Kenya, the project is still unlikely to contribute to the perceptions that the Governance Indicator captures. Nigeria is in the same outlier group as Kenya for the year 2010 in the Political Stability category, but it also had an outlier for 2009. This may indicate a trend beginning in Nigeria’s governance. These two years saw increasing violence from Boko Haram, a militant Islamic group that left over a thousand dead in 2009, as well as the riots in Jos between Muslim and Christian ethnic groups to create a serious instability in the country. It was also a transition period for the political class, as Goodluck Jonathan was inaugurated as Nigeria’s president following the death of Umaru Yar’Adua. Human Rights Watch also commented that while the independent press is able to criticize the government, journalists are still targeted for violence as seen in the murders of reporters in Lagos and Jos. These events likely contributed to the outlier of Nigeria’s scores in these years. While an ICT program would likely have not prevented these events, have any been put in place that would address any of these social or political problems? With the problems as complex in a country as large as Nigeria, the policies set by the national government will likely have a larger impact on the national Governance Indicator than any non-governmental project. Thus the implementation of a National ICT4D Plan would seemingly provide projects that might aid the perceptions that go into Political Stability. However, upon examination of the 40 current and former projects conducted by the Nigerian Information Technology Development Agency (NITDA) there are none that focus on topics specifically related to the recent destabilizing events in the country, or go towards providing increased freedom of expression or a creation of producers of alternate information. The majority of programs concentrate on e-learning, e-government, or infrastructure. It is peculiar for techno-optimists to speak of the democratic properties of ICT and yet a nation like Nigeria sees little investment in those areas by its own government. Additionally, the mission statement of objectives of the National ICT Policy makes no mention of increasing individual freedoms or providing alternative sources of information. While the argument can be made that improving the penetration rates, increasing technological literacy and improving the workflows of public sector employees can have round-a-bout effects on governance and political stability, the proponents of using digital ICTs as a boon for democracy seem to have lost out in the tender process in Nigerian ICT projects. The Rule of Law indicator for 2010 is where Zimbabwe appeared as an outlier. This indicator measured the perceptions that citizens had confidence in others abiding by the rules of society. The areas of contract enforcement, the police, the courts, and the likelihood of violence all factor into this measure. In 2010, Zimbabwe was two years into its Global Political Agreement that brought together the rival parties of Mugabe’s ZANU-PF and Tsvangirai’s MDC. This period of time should have increased confidence in the rules of society, however this year began the community outreach on the new constitution. Significant violence accompanied this program as ZANU-PF supporters sought to disrupt meetings and prevent attendance. In the area of freedom of expression, Zimbabwe failed to roll back much of the legislation that allowed the government to jail journalists for their publications. While restriction were lifted on independent journalists, the harassment and threats towards journalists have not abated. Another area which saw negative developments was in the regional court system. Zimbabwe’s objections to the jurisdiction of the Southern African Development Community Tribunal, which ruled in favor of 79 white commercial farmers against the government, were upheld by the leaders of SADC. Zimbabwe’s courts failure to respect this ruling had previously furthered undermined the faith in the court system and the endorsement of SADC hindered justice significantly. While Zimbabwe has engaged in repression against journalists and its citizens in recent years, this has not extended into the digital realm except for the hacking of journalist’s emails. Appropriately, a collaboration of NGOs in Zimbabwe seeks to use tools such as email and the Internet for the promotion of democracy in the country. The Kubatana Trust of Zimbabwe has as its primary goal to strengthen the use of email and Internet strategies used by other NGOS in the country. By making human rights and civic education information available in electronic form in their database, they seek to be the hub of the digital presence of over 250 NGOs. By providing them this platform, the individual NGOs do not have to set up their own separate website. The Trust is thus charged with hosting the history of electronic activism in the country. The archives of campaigns are then provided for future projects organizers to access and learn lessons about advocating, mobilizing, and lobbying. The Trust calls on citizens to use their mobile phones for multiple uses that keep tabs on police officials, spread information of truth and inspiration, and to lobby media organizations to carry stories about social or political injustice. As the organization headlines the use of using a mobile phone to lobby public officials, it would appear to align with the need for greater perceptions of faith in government institutions. More importantly, after trust is lost, would users continue to lobby those delegitimized officials? More pointedly, would such an initiative help recover the low Rule of Law score that Zimbabwe had in 2010? This is answer would likely reveal itself in examining the public opinions over the course of the following years. Based on the newly released nationwide survey of public opinion conducted by Freedom House in June and July of 2012, the number of Zimbabweans who said the government was doing ‘poorly’ or ‘very poorly’ increased. In 2010, the number was 9% compared to 44% in the summer of 2012. By applying Dahl’s framework for ICTs to the Kubatana Trust we can understand this increase in the face of their work. The first piece of the framework, examining how communications would impact freedom of expression, would initially seem to rate Kubatana positively. They advocate for citizens to use their mobile phones to lobby public officials and let them know that they are actively concerned about a recent social or political injustice. However, people would have to feel secure enough in their anonymity when giving that feedback, or be part of a larger group that could pressure a local government official. With 58% of Zimbabweans reporting experiences with political violence between 2008 and 2010, this level of security is unrealized in the country. With this experience, making a public phone call to any official to lobby them to change their actions or decisions in some matter or another is a very high expectation. In the second part of the framework, Dahl says that the technology should contribute an alternate form of information. While the website and Trust provide a source for other NGOs to collaborate and archive their work, the low level of internet penetration would prevent the majority of Zimbabweans from accessing these first hand reports on NGO’s activity through a digital source. Obviously the NGO could publish and advertise their activities through other mediums, but it is the digital world that is under examination in this case. Lastly, unless significant security went in to preventing the Zimbabwean government from using the information in the archive to identify activists and to plan responses to potential similar campaigns, the website could be a treasure trove of data for Zimbabwean surveillance. The thought that Zimbabwean security forces are too technologically illiterate was certainly diminished by the reports that China was providing an electronic eavesdropping complex on the outskirts of Harare. While the ambitions of the Trust are in line with those Liberation Technology scholars who believe the use of mobile phones can be used as ‘accountability tech’, the possibility that the Trust’s actions would directly affect Zimbabwe’s score in Rule of Law, or other Governance indicators would be small given the limitations discussed above. The findings in this qualitative analysis support the findings of the previous section and its hypothesis. ICT projects, policies, and platforms have not accomplished the promotion of democratic principles, enabling freedoms of expression, or providing secure sources of alternative information. These examples show that ICT is not a magic bullet that can be deployed into less-than-democratic regimes to be the cure all for the country’s needs. Platforms, policies, and projects have to approach the promotion of democracy from the proper theoretical background in order to properly align their goals with results that will produce a more democratic and free society. Even with well thought out objectives and implementation, uses of ICT still face the ultimate hurdle: the authoritarian state. When the state itself is actively or subversively inhibiting the growth of democracy, ICTs prove to be an even battle ground in many instances, especially when ICT penetration has not created a public that is digital connected. With the African state looking north and to the east for governance models to copy in order to remain in power, practices of digital censorship begin to emerge. However, as the next section shows, censorship is not a recent import to the African continent. Despite the power of digital ICTs, the ability to censor and prosecute opinions that contradict the state remains in the hands of authoritarian governments in Sub-Saharan Africa. Censorship has a long history on the continent, one that pre-dates the Internet and colonial rule. Robert Martin writes about censorship in colonial Africa, saying that there was little free expression on the continent because “[it] is [an] essential precondition to democratic politics”. Colonialism itself was the antithesis to democracy, and as such it needed to prevent the citizens of colonies from being informed, aware, and active participants in the government. The best way to prevent this was the banning of publishing information in order to prevent the colonized from being informed and developing public opinions. If colonialism had allowed for free expression and the space for a free press and media, that space would be used to criticize colonialism, both “in the abstract and in its concrete presence in their own country” and lead to calls for an end of the system. Therefore, the nature of colonialism based its survival on stopping the spread of information. This did not change when African leaders assumed control of the former colonies. The colonial laws that banned or inhibited forms of expression were “maintained and in many instances were enhanced”. This was despite the role that African-language newspapers had played in the independence movements. Martin documents examples in Kenya, Tanzania, and Nigeria, where the new regimes created laws that would give them censorship abilities when it was in the best interest of the ‘public’. This power did not go unchallenged, as Martin cites a UNESCO seminar that reported 48 journalists had been killed between 1969 and 1991. It is important to understand the reasoning and motives of these original African leaders, because many of them, or at the very least their political parties, still run their countries today. Martin believes three explanations are behind their actions: unity, development, and nationalism. Unity was a concept that was important to many African liberation movements, that the idea was integrated into many new constitutions and national mottos. This was essential is the country was to make inroads on social and economic progress. Thus any critic of the government was cast as one opposed to socio-economic progress or as an enemy of the unity of the ‘people’. With the ‘people’ being said to be represented by the ruling party, any criticisms of the party was often cast in the same light. Often the state and the party became inseparable, thus allowing any form of criticism to be shaped as against any sort of government or party progress. Focusing on development as the main objective of the government, free expression was not seen to be integral in achieving their goal. The mass media was supposed to serve the government’s agenda, not derail or interfere in their development projects. This led to the creation of development journalism, where reporting became secondary to the needs of development projects, and the media became another proponent of the power of the state. Under the flag of nationalism, any media that strayed from this role could be cast as supporting ‘Western’ values of freedom of expression. Martin ends his analysis in the 1990s by discussing how developmental journalism came to be seen as inhibiting democracy. The wave of change sweeping over Africa in the early 1990s, led to many UN organizations calling for reform that centered on freedom of expression, because of the theoretical and practical links that exist between a stable democracy and freedom of expression. Despite his analysis not continuing into the present day, he lays down a history of censorship by African governments and their reasoning for doing so. Below, this reasoning and the actions associated with it will be discussed in the context of the digital media currently on the continent. With Mackinnon and Morozov warning about the potential of the authoritarian state such as Iran and China using the Internet to increase their power, it was only a matter of time till regimes in Sub-Saharan Africa copied this trend. Though it has been understudied so far, the past year in Internet freedom for users in Africa has been particularly troubling. The rise of the state using offline laws to prosecute online actions is growing, and not just in journalism. Increasingly, African states are monitoring social media to watch and potentially eliminate dissenters. While the quantitative section could not capture these new actions because of the time lag for data collection, this potential limiting of online freedom deserves brief mention. Online Africa, one of the most comprehensive Internet news tracking sites for Africa has recently compiled a list of those actions directed at online journalism and internet media. It notes that while in the past most arrests were made in North Africa, the occurrences of arresting journalists for content they have published online has increased in Ethiopia and Eritrea. It also documented the detention and beating of a blogger in Guinea-Bissau, and the arrest of a journalists who questioned Burundi’s defensive capability. Ethiopia has been a common practitioner of blocking political websites to go along with the typical filter on independent news and human rights websites. With the infrastructure in the country state-owned, control is completely in the government’s control. This certainly saves having to add pressure to the Internet Service Providers as Morozov outlined, but the by product is an Internet penetration of only 72,000 Internet users out of a population of nearly 85 million. The filtering, which has been in placed since the violent protests that followed the 2005 elections, also includes blocking Voice of Internet Protocol (VoIP) services such as Skype, which the government denies. To avoid the economic strangulation of Internet filtering is the concept of ‘just-in-time’ blocking of sites and services during key areas of unrest or protests. Uganda shut down Facebook and Twitter for 24 hours during the Walk to Work protest in April 2011. Service providers received a letter that claimed the Uganda Communications Commission had received complaints from ‘security’ that there was a need to “minimise the use of the media that may escalate violence to the public”. Recent penetration in social media on the continent has seen arrests take place for comments placed on social networking websites. Most result from defamation suits, which would appear to be treating these online services more like official journalism media rather than private space of individuals and communities. ‘Facebook arrests’, so named for the social media website, have referred to arrests made of citizens who post comments to the social networking platform that are said to either offend, or cause national security issues. In early 2011, the first arrest of that kind in Zimbabwe took place. The user was arrested after posting a message to a page that was set up by Prime Minister Morgan Tsvangirai which made reference to the Arab Spring and the shockwaves that it was sending to dictators. The man was charged with subversion. In Kenya, a Facebook user was arrested for making a defaming comment towards an assistant minister in the Kenyan Cabinet . The arrest was part of a larger growth in complaints about defamation made on social media websites across the continent. Unfortunately, the organization set up to deal with Internet related material desires more regulation in the name of controlling social media to ensure it is not being used to incite violence or be a platform for defamation. Finally, while the most famous uses for social media to date on the African continent are those actions taken by citizens in North Africa, the networking sites have been used by activists in other parts of the country. However, with the fame of Egypt and Tunisia, governments have taken appropriate action to inhibit online mobilizing. Both Angola and Sudan have seen protest movements attempt to gain strength but have failed because the government infiltrated the online group, or promptly waited for members at their rally sites to arrest them. This is a future area of critical research that needs to be undertaken to fill in the quantitative gap on the uses of the Internet for democratic purposes on the continent. While there are many diverse projects that work towards social, economic, and political development, very few places document the status of government’s working to oppose democratic movements. While the leaders in freedom measurements in the online world do document some behaviors of African states, not enough is material is available currently to get an understanding of what is happening outside of the major internet countries on the continent (South Africa, Nigeria, and Kenya). As countries like Zimbabwe and Angola continue to oppress their citizens in the offline world, efforts need to be undertaken to understand how best to support activists in the digital world before the governments become so far entrenched in their digital dominance that it begins to become a major factor in their offline repression. This paper has taken a distinct skeptical view of the usage of information and communication technologies supporting the democratic process in Africa. However, the conclusion that new digital technologies play no part in the making of democracy on the continent should not be reached. The literature review conducted clearly shows there are some critical features that information technology provides to the democratic process, if the assumption is accepted that freedom of expression and open communication are advantageous to a democracy, which this paper does. Despite these ideals, the argument that certain political rights can be suspended or delayed in order to promote economic development holds weight in many places in the developing world. The current trend of China’s investment into Africa, while not covered in this paper in much detail, has created a closer partner for economic development. This close partner has become a role model to some African states in that China’s economic development has been placed above the need for certain political, economic, and human rights. The might of China’s current economy would seem to suggest that African countries would do well to emulate this model. With China’s censorship of the Internet and associated medias well known, a concern is warranted in respects of the ‘African Internet’. Will countries seek to improve their controls in the digital world on their constituents? Will states gain power in the offline world by using technology to gain information about those who advocate democratic change in the digital world? Or might the information revolution cascade into democratic change on the continent before authoritarian regimes have put up the necessarily blockades? These are all critical questions facing the continent in the coming years and the answers require significant research and scholarly thought to ascertain. The ability to increase the freedom of expression and provide alternate sources of information through digital communication technology is undisputed. Dahl’s placement of telecommunication as a critical provider and creator of those two hallmarks of democracy should remind scholars of the power of communication and information in our globalized and connected world. Habermas’s public sphere is well adapted for the new digital landscape and much of the interaction between government and citizen will increasingly take place online. Diamond’s Liberation Technology discourse is an exciting field that takes democratic theory and inserts the new types of digital mediums to explore how they effect society today and in the future. However, the closed literature shows that states will likely not be as unprepared as the Egyptian and Tunisian regimes were in dealing with democratic movements who utilized social media and communications technology to mobilize and communicate their messages to the world. It fact, the current stagnation of democracy in Africa and the lack of a casual relationship between ICT and democracy should make the structural neutrality of technology apparent. The three examples of Kenya, Nigeria, and Zimbabwe showed that there are efforts underway to use new platforms, policies, and projects to enhance democratic values. Despite these efforts, the limitations of these reviewed cases show that they fail to address or target the primary failings of governance in their respective countries. This leads to concern about how the state is or might plan to conduct itself in the digital realm. The repression in the offline world will undoubtedly encroach on the digital playing field, which may bring about more overall repression or instability in the country. This makes it difficult to answer Diamond’s question about technology’s role in the democratic consolidation or reversal following the third wave of democratization that started in the 1990s. Certainly in some countries, technology has been heralded as a way to continue the momentum from the previous decades, but the current data on Africa shows that democratic inroads have for the most part stagnated or receded between 2000-2010. The new tools of social media may present avenues that were unavailable during this time period, and observation and research needs to be focused on how Africans communicate, organize, and eventually mobilize through this medium of digital communication. Nevertheless, scholars and activists should not just assume that the power of these new tools will go uncontested. Understanding how the state acts, reacts, and strikes back in the digital world will be even more important for democratic studies in the future because of the vast impact information and communication have in authoritarian regimes. These tools can be used to topple oppressive governments as seen in North Africa, or they can be used to consolidate authoritarian rule. It must be recalled that the great democratization of Africa occurred in the early 1990s without these tools of technology to aid the actions of activists. And despite the growth of these tools, democracy has not advanced significantly in the time since as measured on a continental level. The growth of Africa’s economies has headlined much of the recent worldwide attention on the continent. While there have been the ‘typical’ African conflicts in the eyes of the Western media, a distinct shift is underway in how the outside world views and thinks of Africa. Rather as a basket case or a destination of our pity and charity, the continent is seen as the next engine of economic growth because of technological innovation. The emerging middle class, the improving areas of human development, and the booming tech scene all speak to an Africa beginning to take its place on the international scene in a reinvigorated fashion. It will be important to make sure that the engine of economic growth does not permit the countries of Sub-Saharan Africa to use digital tools to suppress the rights and freedoms of their citizens. Instead, it will be important to create the right conditions for Africans to advocate for and secure their economic, political, and human rights in both the offline and digital worlds. Feel free to cite. This was set up to further academic research so I would be honored if anyone found it useful!